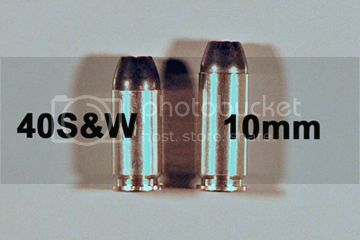 Since I'm a 10mm fan and S&W 10mms' have long been out of production,gonna make a couple. There are threads on the S&W forum about how to do it successfully. I'll be doing it on a S&W CS40 and one of the 4013/4014/4053/4054. 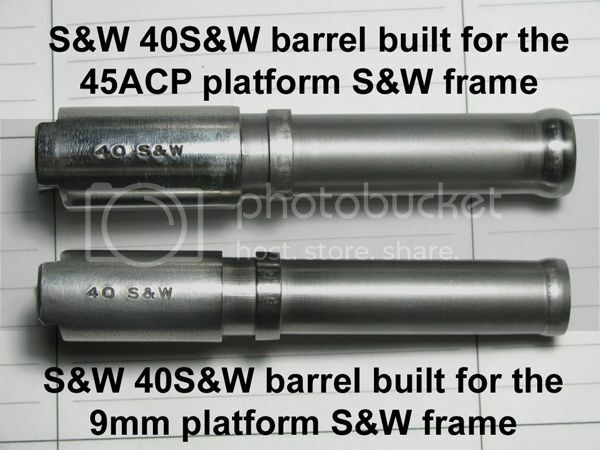 Barrel chambers have to be lengthened,Brownells has the 10mm chamber reamer. The CS40 is built on the CS45 so ejection port is long enough to accommodate,magazine bullet length is adequate. The 4013/4014/4053/4054 is built on the 45 platform,so the above also applies. 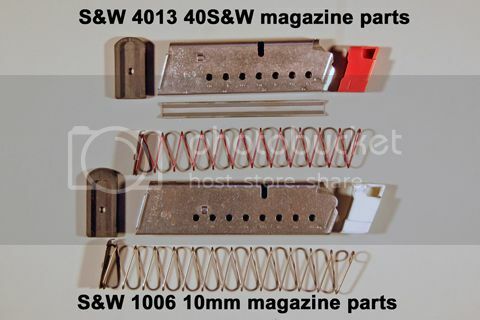 The 40S&W magazines have a 'spacer' along the inside back edge to shorten the bullet length space for the 40S&W. Removing the 'spacer' allows 10mm cartridges into the magazine. 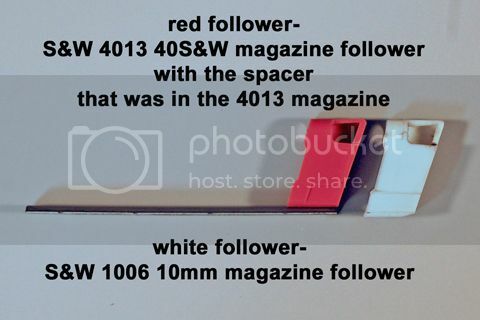 A 10mm follower is then needed to keep the follower from getting 'cocked and jammed'. In the framework,heavier recoil springs and different buffer(both available) to keep the gun from getting beat up from the more powerful cartridge. I've been watching/looking at the gun shows and Armslist at the S&W 40S&W 3rd gens and because of the decline in popularity of the 40,prices are less than 9mms'. I'll report (with pics) along the way. 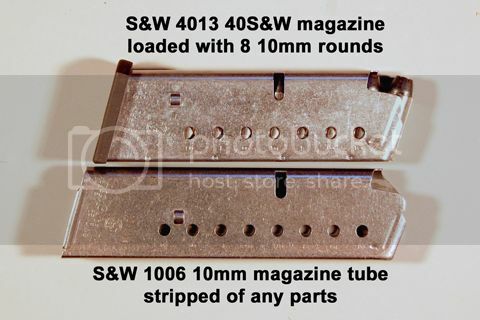 I picked up a 4013 magazine at yesterdays Akron show and disassembled it along with disassembling one of my 10mm magazines. Ordered 10 of the 10mm followers from Numrich. Will it be safe after the conversion, Oldman? I would love to have one myself. I'll be looking forward to your posts. Perhaps you could build one for me? there has never been a problem with the ones built on the S&W forum,40S&W SAAMI PSI is 35,000,10mm SAAMI PSI is 37,500,factory proof loads are 2X-3X SAAMI pressure. Handloading a hot 40S&W will be above 10mm factory pressure. Nice winter project post pics along the way. I have a project started myself its been setting a few years now on the back burner. next will be acquiring one of the 4 pistols for modding/conversion. In post #2,it was asked 'is it safe'. Only certain S&W 40S&W pistols should be converted. 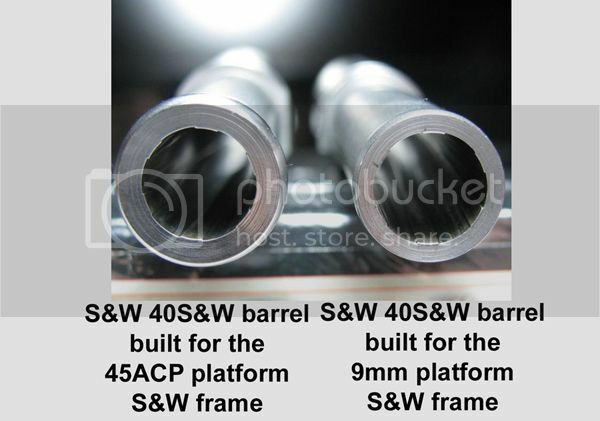 In the last picture of my above post showing the top views of the barrels,the upper meatier barrel is rechamberable to 10mm because the large diameter part in the chamber area is longer than the lower barrel thereby it'll accept the longer chamber needed for 10mm. That was me that asked, 10mm. Excellent photo's BTW. 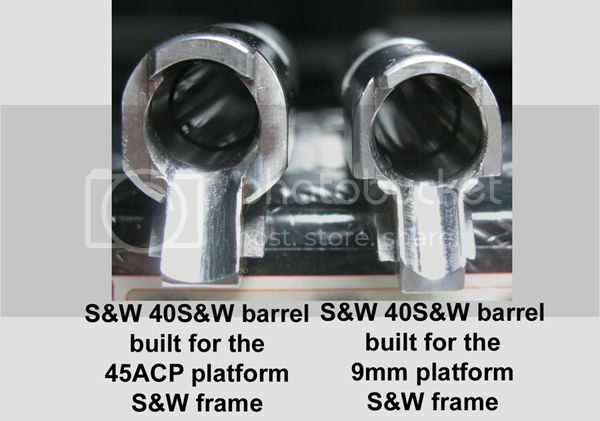 I see what you mean, the thickness of the .40 barrel seems .100 -.150 thou thicker than the 9 platform, and it does have Smith quality. Again, i know nothing compared to you so i will trustfully take your word for it.